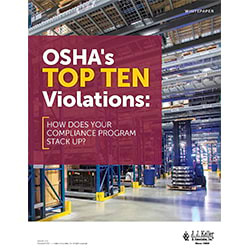 OSHA's Top 10 Violations: How Does Your Compliance Program Stack Up? As a company safety advocate, you want to provide a safe workplace and play a part in your company’s risk management. What better way than to study OSHA’s top violations and learn what you can do now to avoid them? This comprehensive whitepaper walks you through OSHA's top ten violations in 2018. Learn insightful best practices to avoid violations, how to increase your safety management controls, as well as common industry shortcomings. Fill out the form to download your free OSHA's Top 10 Violations whitepaper.